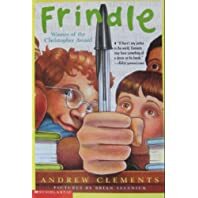 FRINDLE by Andrew Clements is a great example Book Candy – a great, simple read. FRINDLE won’t likely challenge your children’s reading or comprehension – its clear, clean prose makes it a very accessible read. However, this fantastic little story about a boy who is unique, a young man with big ideas and the will to put them to use, will strike a chord with any child who has ever felt different from her peers. And what kid hasn’t? I’m not ashamed to say I cried little tears of happiness at the end of this heart-warming tale (but then I’m kind of mushy). FRINDLE is a case in point why you don’t want to restrict your child to books that challenge their reading level (like that’s possible, right?). Not sure why CSM rates it 9+, but it might be due to the reading level . . . I think FRINDLE is great for all ages. « What is an Advanced Reader? My son Benjamin,9, and I read Frindle a few months ago and we both really enjoyed it. I got a little teary-eyed at the end too! Vicki W.
That would have been a fun one to read together! My son had to tell me, "Mom this is a great book!" We listened this on the way to Michigan for Thanksgiving. Made me cry, too. UPDATE: Frindle is coming to a theatre near you – a performing arts theatre, that is. If you are in the Chicago area, check out the performance of Frindle at the Metropolis Performing Arts Center, February 2010.